10 Must-Have Shots For Every Groom At An Indian Wedding! Why should the brides have all the fun? A wedding album generally consists of a thousand pictures of the bride and very few pictures of the groom. Well, we are not asking the grooms to steal the bride’s thunder, but just remember it’s their wedding too. These photos always seem to capture the anticipation of the groom as the wedding date comes closer. His wedding outfit and accessories deserve a solo shot of them too. The guys generally don’t take very long to get ready as the ladies, and thus some of the best shots come when they're just hanging out together. This shot where the groom looks dapper AF, properly suited-and-booted in his wedding attire, is must have! The moment when he feels like a prince, making the grand entrance with his entourage, deserves to be photographed. The groom surely might have danced his way out at his friend’s and cousin’s baraats. This is his moment now, his baraat and there has to be a pictographic memory of him dancing in his own baraat. In midst of all the rituals and wedding shenanigans, a candid picture with the bride will be a moment to remember! 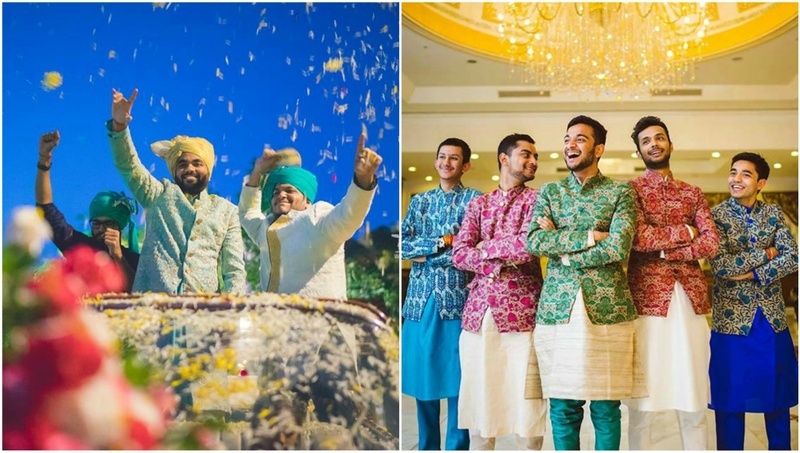 These pictures where the groom realises that he happily bid ‘adieu’ to his bachelorhood are going to be one of the most memorable moments in the years to come. It’s a classic shot when the newlyweds walk hand in hand, taking their first steps into their new life together. Believe us when we say, these are going to be some of the groom’s most cherished moments in the wedding! So, we hope they don’t forget to include them in their wedding.